INCREDIBLE 4 bed/4.5 bath/4 car gar. 3680 s.f CUSTOM HOME in the popular community of Twelve Oaks. 5814 total under roof s.f.. BIG 35,052 s.f. lot. MANY high end PREMIUM QUALITY details & ENERGY EFFICIENT features included! 2x6 walls, complete shearing on exterior walls($5,000 upgrade), premium insulation, water & sound barrier, energy loss sealed, synthetic stucco, low-E windows, 16 Seer HVAC, insulated garage, + more! Kitchen features 42'' staggered cabinets W/led lighting pkg, granite counters, premium appliances, 6 burner gas cooktop, walk-in pantry, & more. 2 fireplaces, 8' int./ ext. 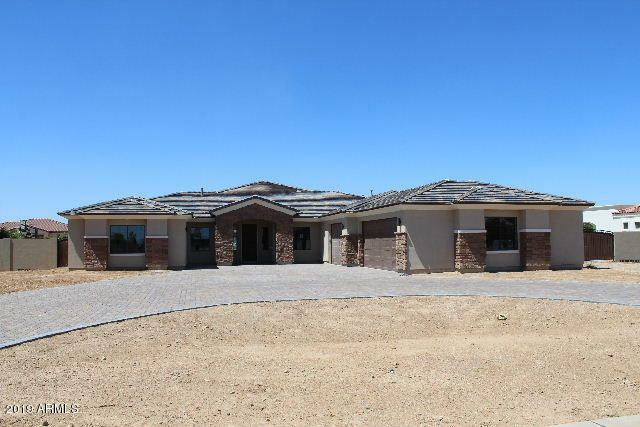 doors, 28' deep garage, PREMIUM paver driveway, & patios (5000 s.f.) & SO MUCH MORE!! RV Garage &/or Guest house/Casita can be added. ***PLEASE SEE UPGRADE LIST in photos & under ''documents tab''. Community park with Volleyball / Basketball, Tot lot play area, & Ramada. Easy access to nearby 303 freeway, upcoming Surprise Mall & New business development (www.prasada.com). Many CUSTOM homes in the neighborhood already with prices up to $1 M. LOWER COST & BETTER VALUE in straight comparison with the other homes being sold in the subdivision. PERFECT LOCATION....bordering just off of the South edge of Surprise East of the 303. Come see this home now....you will love it!